Prussia (German Preußen; Polish: Prusy) was a historic state originating out of the Margraviate of Brandenburg (established 1157) and the Duchy of Prussia (established 1525). Today this territory encompasses much of Germany and Poland. 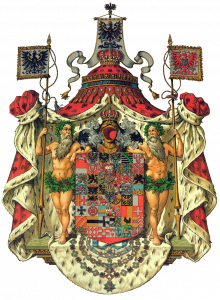 For centuries, the House of Hohenzollern reigned, with a formal monarchy being established by Frederick I (1657-1713; reign 1701-1713), using the title King IN Prussia from 1701 and then, with the rise of Frederick the Great (1712-1786; reign 1740-1786) and the elevation of the Duchy to a Kingdom in 1772, King OF Prussia. The Prussian province of West Prussia (Westpreußen) was established as a political entity in 1772, after the first partition of Poland. 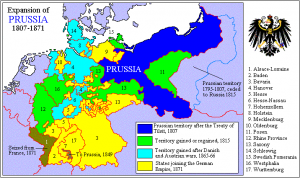 At that time, East and West Prussia (Ost- und Westpreußen) became separate provinces within the Prussian state. in the east – from north to south – are the districts of Elbing, Marienburg, Stuhm, Marienwerder and the Weichsel (Vistula) cities of Graudenz and Schwetz. With its capital originally in Königsberg then from 1701 in Berlin, Prussia indelibly shaped the history of modern Germany. Before 1772, most cities had autonomous status and privileges, which were now abridged or abolished altogether. Until then, for the most part, Jews were not permitted to live in cities, because individual city privileges permitted them to exclude Jews. For this reason, most Jews were living in rural areas, usually under the protection of landowners and estates. Frederick’s views, however, were that Jews should live in the cities, not in the countryside. Since most Jews were rather poor, Frederick did not deem them useful. Only those with at least one thousand Taler could stay, but they were required to live in cities. Subsequently thousands of Jews were expelled from Prussian territory. Despite this Royal Decree, under Frederick’s rule, the Jewish population was restricted in numbers and only privileged Jews were permitted to reside in his kingdom. Jews on the Polish border were therefore encouraged to trade and received protection and support from the king as any other Prussian citizen. After his death in 1786, little changed under his successor, Frederick II. It was only after 1800 that some slight improvements took place. The political scene changed markedly when Napoleon was crowned Emperor in 1804. As leader of a coalition, his army moved through Europe, defeated Prussia in 1806. When Karl August Hardenberg (1750-1822) became chancellor in Prussia in 1810, he and Heinrich Friedrich Karl Reichsfreiherr[a] vom und zum Stein (1757 –1831), commonly known as Baron vom Stein, instituted sweeping reforms including improvements to the army, the abolition of serfdom and feudal burdens, the throwing open of the civil service to all classes, and the complete reform of the educational system. To gain citizen rights, all Jews had to declare themselves to the police within six months of the promulgation of the edict and choose a definitive surname. Jews were finally allowed to own land and take up municipal and university posts. They were free to practise their religion and their traditions were protected. Nevertheless, the edict of emancipation in Prussia did have some limits – Jews could not become army officers or have any government or legal role, but were still required to do military service. In practical terms it took many, many years before Jews in Prussia actually obtained equal rights. The success in integrating the Jews into those areas of society that Frederick encouraged them in can be seen by the role played by Gerson von Bleichröder in financing Bismarck’s efforts to reunite Germany. In 1871, with Napolean III’s defeat in the Franco Prussian war of 1870, the German states united to create the German Empire under Prussian leadership. The years up to 1914 were more or less peaceful for the Jews. Anti-Jewish agitation did occur in 1880/81 and 1900, but the rule of law was always restored. When Germany was defeated in 1918, the Prussian province of West-Prussia effectively ceased to exist. In the north, Danzig and its surrounding area became a Free City (Freie Stadt); in the west, the districts of Deutsch Krone, Schlochau and remnants of the district Flatow were united with a remnant of the Province Posen, called after 1922 Grenzmark Posen-Westpreussen. In the east the German-speaking districts of Elbing, Marienburg, Stuhm and Marienwerder were added to East Prussia and formed a special government district in this province. During the German Revolution of 1918–19, the monarchies were abolished in favour of a republic and the nobility lost political power. The Free State of Prussia became a state of Germany between 1918 and1933. However, in 1920 the largest part of Westpreußen was incorporated into the recreated state Poland. For all practical purposes, Westpreußen as a German province ceased to exist. After 1933, Prussia lost its independence as a result of a coup, when the Nazi regime was successfully establishing its Gleichschaltung laws in pursuit of a unitary state. With the defeat of the Nazis after WWII, the division of Germany into allied-occupation zones and the separation of its territories east of the Oder–Neisse line, which were incorporated into Poland and the Soviet Union, the State of Prussia effectively ceased, existing de jure until its formal liquidation by the Allied Control Council Enactment No. 46 of 25 February 1947. Information adapted from Wikipedia https://en.wikipedia.org/wiki/Prussia and from research done by AJGS member Evelyn Frybort (valid as of March 2017). Large sites such as Familysearch, JRI Poland, Jewishgen, JOWBR – Jewishgen Online Worldwide Burial Registry and Genealogy Indexer all have resources and records useful for Prussian research.